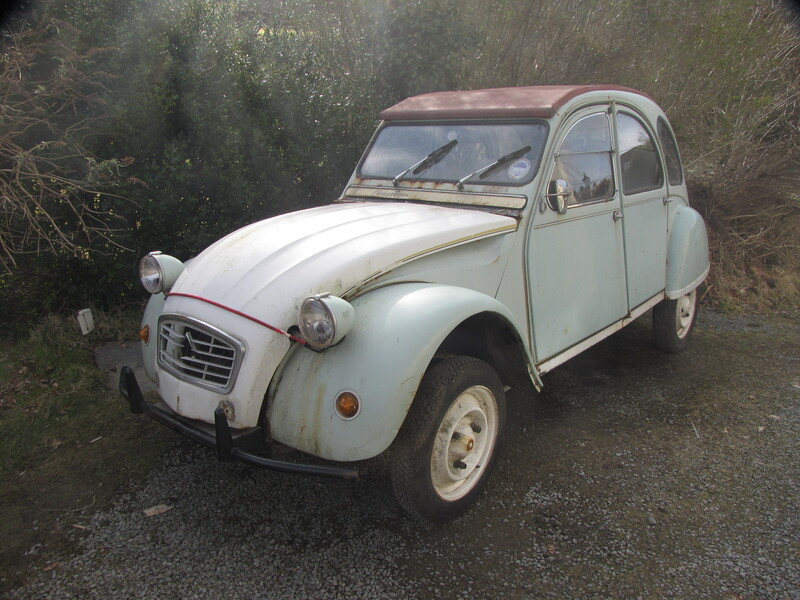 Project 2CV is alive and driving – HubNut – celebrating the average! Yes, the project 2CV is alive, and I even got to enjoy a little drive in it. I actually had the 2CV running, briefly, yesterday. Hooking up a spare battery allowed me to confirm that the sparking was occuring and as no-one had been meddling with it, I assumed the ignition timing would at least be good enough to get it running. Getting the fan guard off to check the points was a bit of a nightmare. One bolt sheared and another just rounded – yet proved too tough to hammer a smaller socket on it. Ugh! In the end, I bent the guard out of the way. The fan off confirmed that there was a spark there, but really I should just have removed a spark plug, connected it up and started the engine as that confirmed the same thing! Oh well. Could this be my new long-term 2CV? I had tried pouring a little fuel in the carb before with no success. It just churned and churned. I tried again yesterday with the same result. At least I was getting the oil to circulate and proving that the starter worked! So I decided to beef up the voltage by connecting both a spare battery and my battery jump pack up. This had it spinning very merrily, and it caught almost straight away. Joy turned to panic as the revs rose, but turning the ignition off and back on stabilised the revs. I think perhaps I’d poured a little too much fuel into the carburettor. It soon conked out again, but I’d proved that it would run at least. It sounded like fuel starvation, so I started to swap the fuel pump with one off another engine. Then I noticed that petrol was leaking everywhere. Hmmm. This suggested that the pump WAS drawing fuel. I now had a problem. Gravity was draining the fuel. This got worse when I investigated how easy it would be to pull the rubber off the metal section down by the front chassis. The metal bit broke apart in my hand due to corrosion. Great. A hasty grab for a jerry can was followed by me pulling the pipe off the chassis clips (thankful it wasn’t cable tied! ), then threading the leaky pipe under the driveshafts so I could get enough free play to raise the end higher than the tank. Phew! The car, the garage and myself were soaked in petrol, but at least no more was leaking out! I decided to quit at this point, experimenting with various concoctions to try and remove the smell of petrol from my hands. My favourite hand cleaner was pretty effective – Ecover’s Heavy Duty Hand Cleaner. It’s just natural ingredients, has good grit content and works brilliantly. It still took a couple of washes to reduce the petrol smell. Today, I sourced some replacement fuel line AND remembered to don latex gloves. After stupidly fitting the other fuel pump (which didn’t work) I eventually had the car running again.